Canal Walkers traverse the Conrail Embankment detour without the company of a passing train. The Delaware Canal as it runs inland from Morrisville to Bristol is safe from flooding, but it hasn’t been at all safe from the demands of progress. When US Steel built its huge Fairless Works in the 1950’s, the explosion of associated development took its toll on the “old” Canal. Highway construction and bridge expansion took precedence over the existence of a historic waterway. The construction of a parking lot for the Levittown Shopping Center was so important that the Canal was relegated to flowing in a pipe beneath the paving. Today walking or biking along the towpath in the south is both a pleasure and a challenge. The Canal remains a green ribbon of nature to be appreciated as it passes through an urbanized area, but traveling on the trail does have its pitfalls. Five major obstructions block the way. The first three obstructions can be overcome by detouring around them. Crossing Route 13, a four-lane highway, twice requires very careful, very quick dashes. Before the floods of 2004, 2005, and 2006 took the wind out of the sails of Canal improvement projects, plans were taking shape to alleviate some of the dangers and inconvenient conditions related to the obstructions. Although flood repair projects rightfully have taken precedence, the trail improvement projects from Morrisville to Bristol have continued to move forward. The most visible of the improvements is at the Levittown Shopping Center where, although the Canal still flows in a pipe underground, the route of the Canal is now defined by an argillite stone pathway and some landscaping. The trail, completed by the shopping center’s developer, is definitely more pedestrian-friendly, but still a far cry from the vision of a watered canal that would be an attraction for shoppers and Canal users alike. The Conrail embankment and the Route 13 North obstructions are considered the most dangerous. At the embankment, one can choose to take the detour route that comes in alarmingly close proximity to active train tracks (including the one used by Amtrak’s high-speed Acela line) or climb a steep slope covered in slippery gravel and cinders. There’s no time to dawdle when it comes to crossing Route 13. 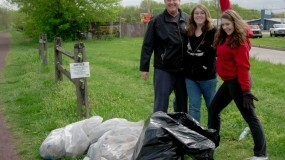 Susan Taylor moves Canal Walkers right along. At Route 13 North, there is little choice but to leave the towpath, climb over the highway guide rail, look both ways several times, then walk/run to the grassy strip between the north and south lanes. From the grassy strip, the process must be repeated in reverse. Plans for dealing with these two obstructions have been in the works for more than a few years. The Delaware Canal State Park Advisory Committee has been a strong advocate, while the PA Department of Conservation and Natural Resources, the Delaware and Lehigh National Heritage Corridor, and, more recently, the Historic Delaware Canal Improvement Corporation have been the prime movers. The East Coast Greenway has provided assistance. A tunnel has been designed to cut through the Conrail embankment, and the project is moving ahead. A pedestrian bridge to cross over Route 13 North was designed, but, because of access issues, proved too costly to build. Now the possibility of tunneling under Route 13 is being explored by consulting engineers. In general, progress has been slow because of the complexity of the problems and the many entities with jurisdiction. There remains a major outstanding question about whether the two tunnels can be built to accommodate both a water channel and a trail. The current plan to deal with the Bridge Street encroachment is steps. The Tyburn Road Embankment and Route 13 South obstructions remain a puzzle, but are secondary concerns as they can be overcome using detour routes that are relatively safe. Another positive development for the southern end of the Canal has been the completion of the Bristol Borough Daylighting feasibility study. The study was a preliminary examination of whether the last 7/10ths of a mile of the Canal that was filled in during the 1940-50’s can be unearthed and restored to a watered state. The findings and public comments were positive. The Daylighting study was conducted by Heritage Conservancy and funded by the Friends of the Delaware Canal and the Historic Delaware Canal Improvement Corporation. 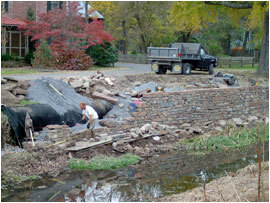 Perseverance has always been needed when dealing with the Delaware Canal. If the obstructions, both water and trail, are to be overcome, perseverance will be needed in mega doses for all those who want to see the Canal improved. 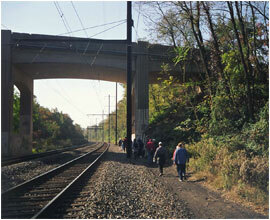 Photo caption: Canal Walkers traverse the Conrail Embankment detour without the company of a passing train. Photo caption: There’s no time to dawdle when it comes to crossing Route 13. 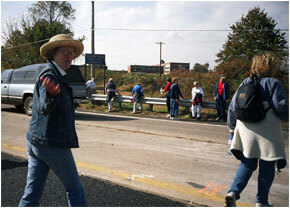 Susan Taylor moves Canal Walkers right along. In the hierarchy of historic canal structures, locks and aqueducts have the top positions, but the dry laid stone walls that retain towpath and berm banks deserve high status. Sometimes hidden from view and nearly always in some state of deterioration, the Delaware Canal’s dry laid stone walls are examples of period craftsmanship that have endured surprisingly well over time. Many of the Canal’s walls form the vital barrier between the Canal and the Delaware River. Some define the boundaries of the towpath and berm. Others facilitated loading and unloading from the canal boats. Photographs from the early 1900’s show a low, dry laid stone wall running along the berm bank in the village of Erwinna. Over the last century, the wall gradually disappeared from view with only the foundation stones placed below the waterline remaining. Last summer Dorsey Reading, who lives along the Canal in Erwinna, broached the possibility of rebuilding a section of the stone wall to the Friends. If the Friends were willing to sponsor the project and coordinate the construction with the State Park, he would be willing to fund the undertaking. 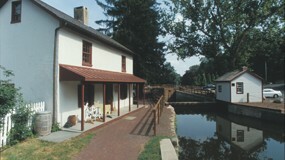 The Friends initially consulted with State officials since the Erwinna wall would be constructed within the boundaries of the Delaware Canal State Park and ultimately would become the property of the State. The concept was approved, and the State engineers endorsed the excavation and masonry plans. Tim Koplin, a mason from Riegelsville who has mastered the art of positioning individual stones so that they coalesce into a structural wall without the use of mortar, was hired for the project. Construction got underway quickly, beginning at the northern project boundary. Soon a handsome wall emerged. So handsome that Jim and Karen Ambrogi, who also live along the Canal in Erwinna, were inspired to try to continue the wall to the Headquarters Road intersection. The Ambrogis and two other donors have contributed the funds for the second, shorter wall section, except for the last 85 linear feet, which will cost approximately $25,000. The new, dry laid stone wall in Erwinna, while restoring the basic integrity of the Canal’s western bank, also illustrates how the waterway appeared in its 19th century heyday. It is turning out to be a superb piece of craftsmanship that demonstrates a modern-day mason’s ability to recreate the spirit of a structure from the past. It can also be used as an interpretive tool to help visitors understand how the Canal was built and the importance of sensitive restoration practices. The Friends thank Dorsey Reading for his excellent initiative and very generous contribution and Jim and Karen Ambrogi, Dana and Dave Dornsife, and Robert and Beverly L’Archevesque for their donations that will extend the project. The mason has finished his work for the winter, but would be happy to return in the spring. Contributions to complete the last 85 feet of the wall will be very much appreciated.